501 books I must read. This was a pretty easy read. While I had never read the book I knew the story pretty well. Mostly from TV or movie adaptations. There were no moments in the book that didn't seem familiar. In fact it really felt like I was re-reading this book. 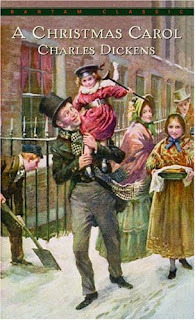 Dickens is a wonderful writer and while this is no Great Expectations (my favorite Dickens story) it was still a wonderful read. There is not much I can say about the story. For I am sure you know it yourself very well. I remember in grade 3 (or was it grade 4?) being in a play version of this story. I was the young boy who Scrooge gets to buy the big prize winning turkey near the end. I only had 2 or 3 lines but I remember that I made a very distinct costume choice. I needed to have a wool hat. Don't know why this wool hat was so important. Oh well. Give this book to your kids to read. A few years ago I bought '501 Must read books'. I slowly plodded along reading a few of the 501 here and there. But lately I've decided to try and read all of them. So far I've read (to see list click ----->) 92 of the 501 ......I have a ways to go. Follow along as I strive to read and find these books. Brisbane to Sydney Opera House.........done!!!!!!! How many of the 501 have you read?